From Goodreads ~ Do you know how to properly conduct yourself in a public restroom? What about while in the midst of a profoundly awkward silence? Have you perfected how to get out of helping your friend move? If you answered no to those questions, fear not. 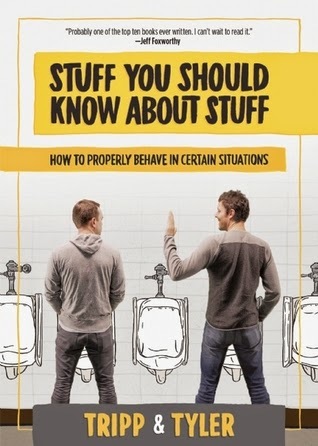 "You need Stuff You Should Know About Stuff", the book that future anthropologists will no doubt call "the Rosetta Stone of handling trivial life situations." From the sketch comedy duo who created the viral videos “Sh*t Nobody Says” and “Things You Can't Do When You’re Not in a Pool", Tripp and Tyler bring you the written word in "Stuff You Should Know About Stuff", a guide instructing you how to navigate the treacherous waters of life’s odd quandaries. There are even photos and illustrations for people who enjoy photos and illustrations and stuff like that. You can read it from cover to cover or you can choose to educate yourself only in conjunction with your bowel movements. Totally your call there. "Stuff You Should Know About Stuff" places the priority on the trivial experiences of life, because that's where we spend most of our time; trying to recover from going for the fist bump when a casual acquaintance wanted a high five. Tripp and Tyler are a sketch comedy duo most known for their funny and viral YouTube videos. They started creating their original material in 2006 and have they’ve amassed over 30 million YouTube views and over 100,000 subscribers. Each year they host live events for over 250,000 people where they perform original sketches, interact with the audience, and interview notable personalities. It's a cute funny quick read.